Since my son was little, I have always enjoyed exploring new parks and playgrounds and have seen some awesome places, which were not only lots of fun for the little ones, but also had great amenities for parents. 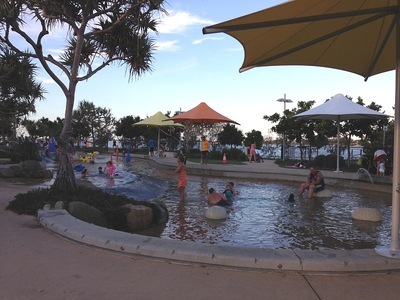 Just when I thought I had seen the best, I came across Carey Park, located across the road from Australia Fair Shopping Centre on the Gold Coast. OMG what a paradise. 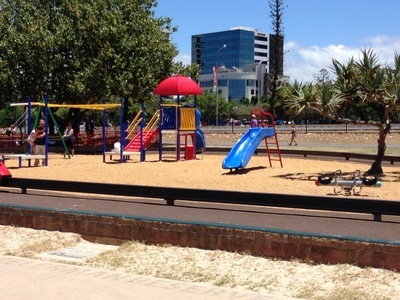 This park has everything a family could need for an exciting day out. 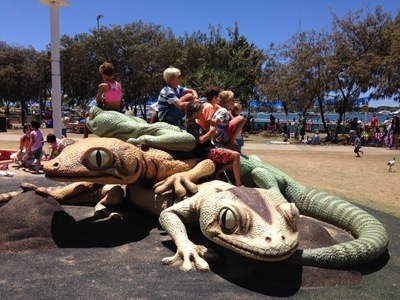 The play equipment includes a giant jumping pillow which is sheltered by a large sail, swings, gekko statues, flying fox, bikes mounted on a track that you can ride around and lots of other playground equipment. 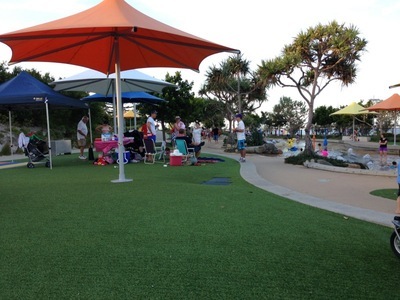 The park has plenty of picnic tables and BBQs as well as green grassy areas. 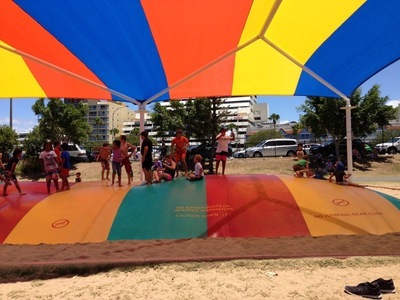 It is located right near a beach that has no waves, making it suitable for even young swimmers. 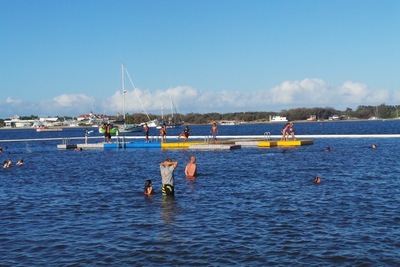 Part of the beach is protected by shark net and includes a pontoon from which children can dive into the water. 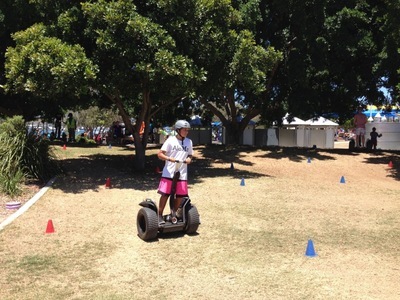 On the weekends you will often find a Segway course set up, which older children will enjoy riding. The cost is only $5 for 5 laps. Definitely a great value for money. 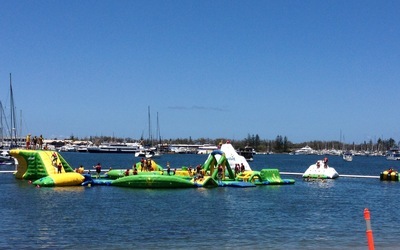 During summer Aqua Splash sets up a giant inflatable jumping course. For a small fee of $5 (for 5-9 year olds) $10 (for 11-16 year olds), your child can spend an hour climbing, jumping and challenging him/herself . Aqua Splash is open daily from 8am - 7pm. Sessions start every hour on the hour, but you will need to book in for a session when you arrive. Even during busy times, however, you can usually get in on the next session. 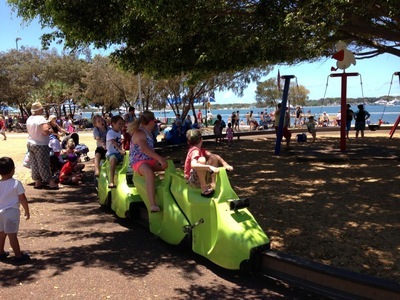 Walk or ride a bike along the pathway and you will come across a small water park with fountains, shallow pools and obstacle courses for the kids. 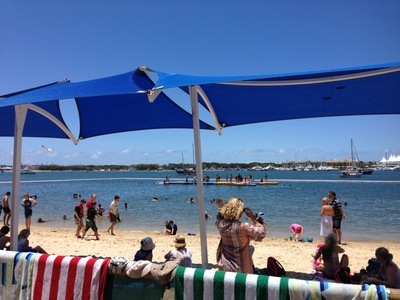 This is a great spot to spend a hot summer's day. For lunch head to the park cafe or across the road to Australia Fair Shopping Centre which has plenty of food alternatives. 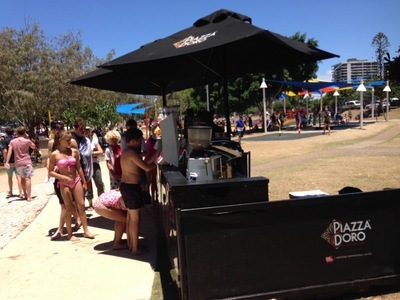 You will also find cafe stands in the park for a quick pick-me-up. 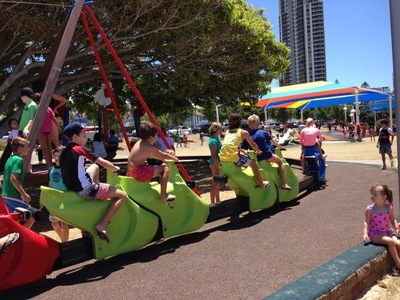 Change rooms, toilets and bubblers are also available in the park and a large carpark is located across the road or within the shopping centre. In my view, this is the best park I have ever been to and would rate it 20 out of 10.